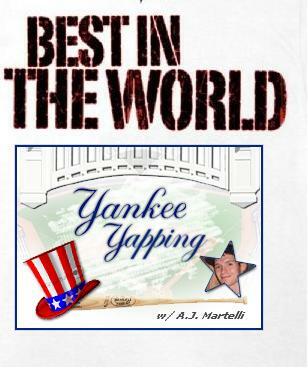 Yankee Yapping | Stories, analysis, highlights, and everything Yankees from an up & coming sports journalist. The loyal readers of the blog have most assuredly realized that Yankee Yapping has been conspicuous by its long absence. There hasn’t been a new post in nearly three years, for a variety of reasons. Responsibilities of life. Commitments. Errands. Downtime. It’s been a struggle to balance it all and make time for Yankee Yapping. When I first started Yankee Yapping in July of 2009, I was an ambitious, aspiring sports reporter with a year left in college. I was encouraged by an interview subject (who happened to be Rick Wolff, son of the late Bob Wolff, who called Don Larsen’s perfect game in the 1956 World Series) to start my own blog and to write about topics that interest me. And so the journey began. I was able to maintain the blog when I began my career as a professional sports reporter, working for The North County News and subsequently, The Examiner, in Westchester County. Both being hyper-local weekly newspapers, deadlines were generous and thus, there was plenty of time for blogging. When I started working full-time at the daily Poughkeepsie Journal over four years ago, I knew my time for Yankee Yapping was going to become limited, at best. The original schedule I worked was 2:30 p.m. until 10:30 p.m., five – sometimes six – days a week. My schedule has since changed, but the workload hasn’t. In fact, over the past year, I’ve been asked to take up news reporting one day a week. It’s made sports reporting a little more challenging, trying to balance the time for creating good, compelling sports stories while standing on my tip-toes and being ready to run at a moment’s notice for breaking news. However, I do feel I’ve evolved as a journalist. And, the work has been worth the rewards. I won first place in the 2017 New York State Associated Press contest for my story Sidelined: Men outnumber women in coaching roles. The same story won the Distinguished Sports Writing Award of Excellence in the New York News Publishers Association contest. On top of that, myself and two of my colleagues won the NYNPA Distinguished Live Sports Coverage Award of Excellence. It’s good to know the work I’m doing is making an impact and people are reading. And while there really isn’t much time to enjoy the fruits of your labor as a sports reporter, as once you finish one story it’s right on to the next one, much of the sports work I’ve been assigned these past few years has been enjoyable. Covering a rehab start made by none other than Matt Harvey, with the New York Mets at the time. Interviewing Dennis Haskins, AKA Mr. Belding of “Saved by the Bell” fame, at a Minor League Baseball team’s promotional night. Covering Brendan McKay, the fourth overall pick in the 2017 MLB Draft. McKay is a hybrid pitcher/first baseman, and obvious comparisons have been drawn between him and Shohei Otani. Writing a feature on Blake Butera, who at 25 last year, was the youngest manager in all of pro baseball. Writing a story on how minor league baseball players adjust when living with host families. An interview and story on former New York Jets and current Seattle Seahawks kicker Jason Myers (although he was with the Jacksonville Jaguars when I did the story). An interview and story on New York Giants General Manager Dave Gettleman (As a note, he got the job with the Giants after I interviewed him; he was in between jobs at the time, following his firing by the Carolina Panthers). An interview with Rey Mysterio, former world wrestling champion of WWE and WCW fame. Basically becoming a beat writer for Tyler Adams, formerly of the New York Red Bulls and U.S. Men’s National Team, now with RB Leipzig in Germany. And recently, a story on Lucio Battista, a man with a crazy mustache who will attempt to make waves on the TV show “American Ninja Warrior” later this month. Oh, and if you’re wondering what it’s like to dive feet-first into a breaking news assignment, well… Sometimes there are alligators. Yes, alligators. Of course, none of these are stories about the Yankees. But as a sports reporter I’ve learned, the reality is, you often don’t get to pick what you want to write about; what your passions are. Still, there are ways to have fun with your beat and have fun with the job, even if you’re not writing about the Yankees. That being said, my Yankee fandom hasn’t waned. 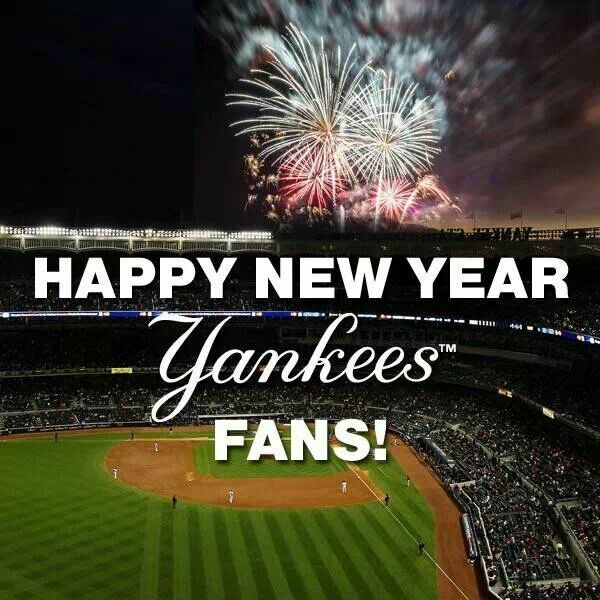 I still watch as many games as I can and have attended a handful of games since the last Yankee Yapping post. I actually checked off an item from the bucket list on Aug. 12, 2016, attending the Yankees’ game against the Tampa Bay Rays. Kevin Kiermaier or Steven Souza Jr. – still don’t know which player – tossed me a ball during batting practice. That game also happened to be Alex Rodriguez’s last hurrah, and it came on the eve of the Yankees calling up Aaron Judge. What I haven’t done, though, is sit in the Yankee Stadium press box to cover a game. Or interview Derek Jeter. And obviously, I am not working for MLB.com. So, yes. There are some unrealized dreams out there. Perhaps, if I remain as lucky as I’ve been, one day those dreams will come true. But, even if they don’t, I’ve already been blessed with a fine career that’s spanned almost a decade and has included great stories, interviews with great people and feedback from great readers. No, I may not have landed the Jeter interview or coverage of a Yankee game, yet I’m proud of the hard work I have done – and that includes Yankee Yapping. MLB.com recognized Yankee Yapping several times. 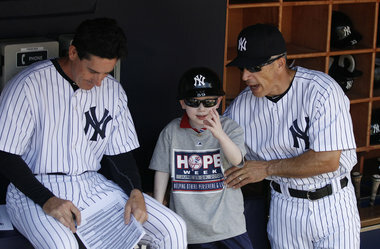 David Cone mentioned Yankee Yapping during the telecast of a game on the YES Network. Author Danny Peary even included an excerpt from Yankee Yapping in a book he wrote about Jeter. It’s been amazing. And now… Can I say it’s over? 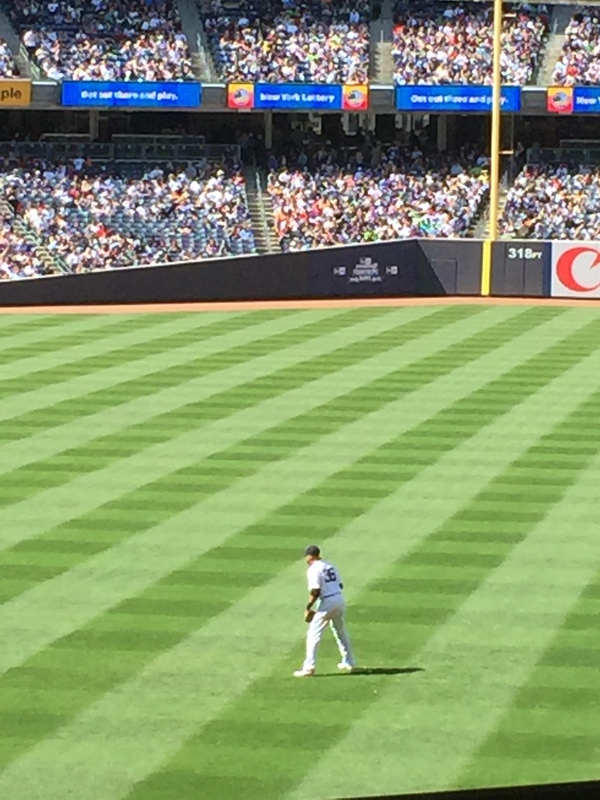 Is Yankee Yapping officially going into the Monument Park of blogs and retiring? I don’t know. What I do know is, for now, it will remain on pause as my full-time job at The Poughkeepsie Journal and USA Today Network continues. 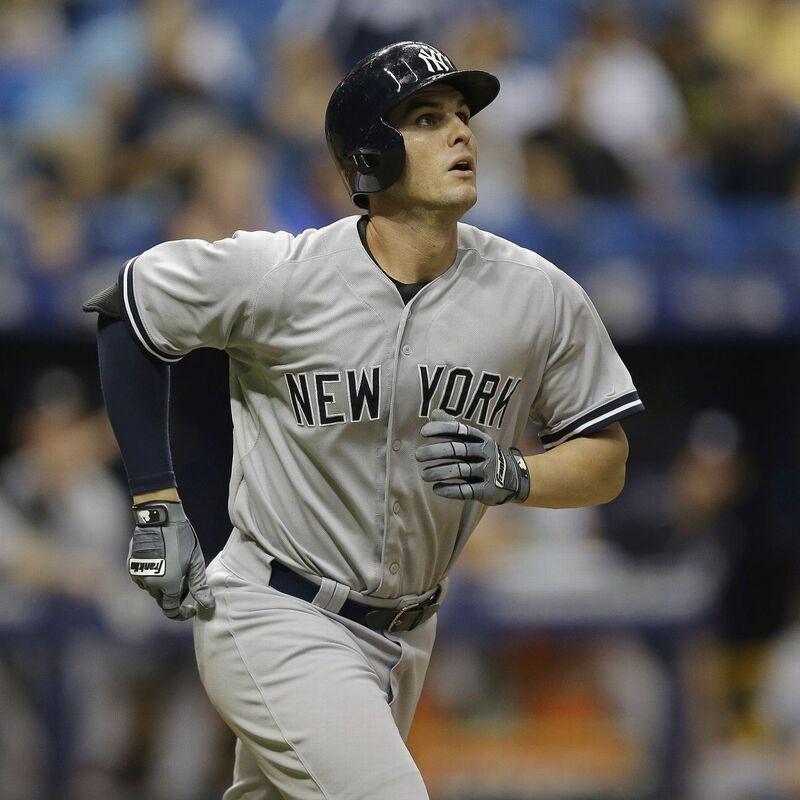 Maybe in a month, I’ll get the itch to talk about why I think Judge deserves to be the American League’s Most Valuable Player. Maybe at the end of the season, if the Yanks win the World Series, I’ll want to write about the thrill of number 28 and what the title would mean to me. Maybe at the end of 2019, or in 2020 or beyond, I’ll be writing to let everyone know MLB.com has hired me as a staff writer. I occasionally still tweet on the Yankee Yapping Twitter account (@YankeeYapping) and feel free to follow me on my (hopefully soon-to-be verified!) professional account, @AJ_Martelli, where I tweet about games I’m covering and stories I’m doing, but still tweet about the Yankees, from time to time. I can’t thank the readers of Yankee Yapping enough. It has been appreciated, even after all this time! I’m bad at goodbyes. So I’m not saying goodbye. It’s not goodbye. 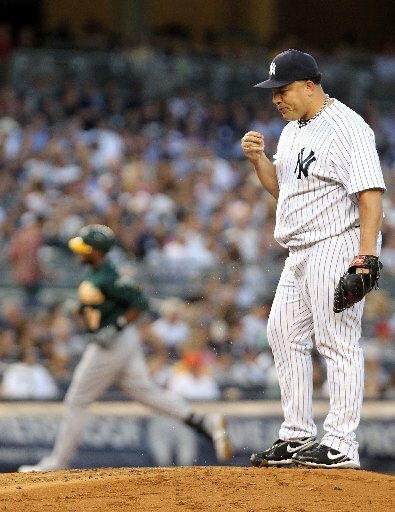 Bartolo Colon delivered the pitch. Brandon Allen took a mighty swing and struck it high and far to right field. The ball just seemed to have been in the sky forever on that August night in 2011. The hangtime had to have been close to 10 seconds, easy. The sphere of leather and cowhide towered deep into the early evening air. Right fielder Nick Swisher didn’t even move. He could only watch as the ball vanished into the far reaches of the upper deck at Yankee Stadium. Solo home run. 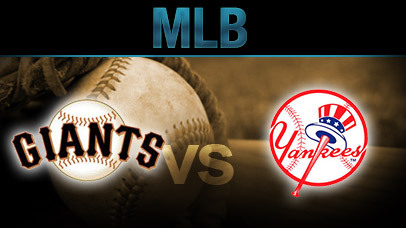 Oakland Athletics lead the Yankees 1-0 in the top of the second. From the seats behind the wall in left field, I turned to my friend Micheal. We were among the thousands of fans bewildered at what we had all just seen. By far, no questions asked, it was the most prolific home run I have ever witnessed. There’s an old saying that “chicks dig the long ball” but I think that saying is true of everyone, not just “chicks.” One of the most exciting parts of going to a ballgame, no matter if you’re a male or female, is bearing witness to a moon shot; a home run that travels an astounding distance. Nothing beats seeing one live and up close. And although it was incredible watching Allen’s mashed tater into an area few hitters go, I do however wish he was wearing pinstripes when he accomplished the feat. But make no mistake, there have been some Yankees who have dropped bombs that make Hiroshima and Nagasaki look like kid stuff. The magnificent Yankee being one of the more known assailants. Back in May of 1963, Mickey Mantle obliterated an offering from Bill Fischer of the Kansas City A’s. The ball went so far, it caromed off the façade – or frieze – atop Yankee Stadium, and it came close to being knocked out of the stadium altogether. Yet, players not wearing pinstripes have also murdered their share of home runs. Like the current all-time home run record holder, Barry Bonds. I only wish I could have been at Yankee Stadium in June of 2002 when the San Francisco Giants paid the Bombers a visit. In the first inning, Bonds came up and completely blasted a three-run home run off Ted Lilly. To that point, I had never seen a batter hit a ball that far into the upper deck. Even watching Bonds’ yard work on television left me amazed, but I can’t imagine the TV did it justice, had I been there in-person. And that’s my point. Until you see a long, tape measure homer in-person, I’m not certain you can truly appreciate it. That being said, what’s the longest home run you’ve ever seen live? And did whoever club it leave you as amazed as Allen left me in 2011? Imagine you’re a sports writer. And you’re sitting in your newsroom at your desk on a busy Saturday, typing away feverishly at your keyboard to meet deadline. Then your phone goes off. A notification from Twitter. Really. And thank you to Gershon Rabinowitz for bringing it to my attention. At first I just thought it was maybe an amateur writer who happened to get a book deal and pulled an excerpt from Yankee Yapping’s October, 2014 piece The Boone Identity: Remembering the Radical 2003 Yankees-Red Sox Saga. It’s honestly an honor. To have my name in ink and in the same collection of pages with so many who have spent time with Jeter, interviewed him and know him personally is very nice. However, Peary gave the credit to MLB.com. While I’m currently working for the Poughkeepsie Journal, a Gannett newspaper, one day I’d love to work for MLB.com — as that’s been well documented in Yankee Yapping over the years. Nevertheless, I appreciate him using my words. Being quoted in the Jeter book ranks just above being cited on the Wikipedia page of Joe Panik, the San Francisco Giants’ second baseman. To read that story on Panik from September, click here. 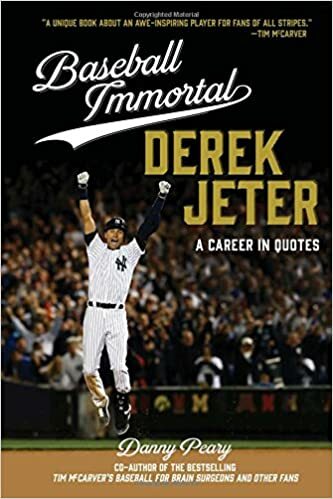 To order “Baseball Immortal: Derek Jeter: A Career in Quotes” click here. I have not read the entire book yet, but according to what the consumers on Amazon.com are saying, it’s worthy of a read and a smash hit. “The concept is as fun as the information in the book itself. It’s one of those ‘I’ll just read one more quote’ kind of books where you read one more, and then the next and then the next, and so on. I think Peary should send me a free, autographed copy. But hey, that’s just me.